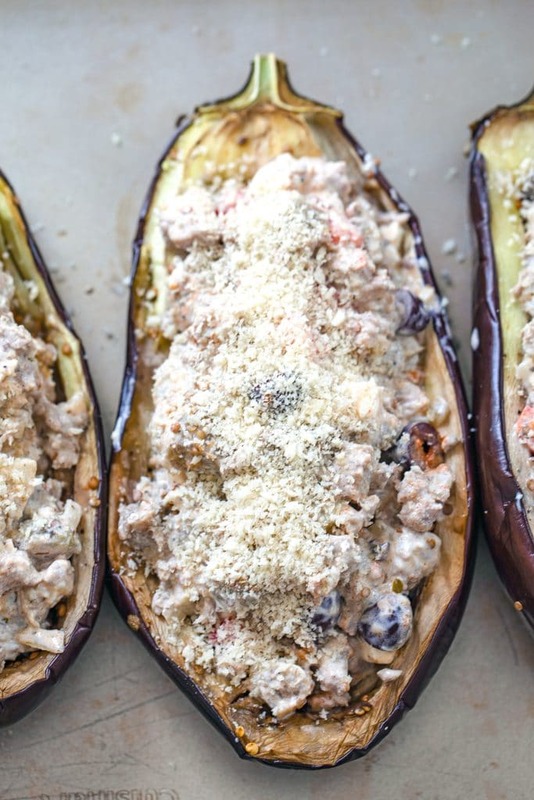 This Mediterranean Turkey Stuffed Eggplant is a deliciously creamy dish packed with ground turkey, Greek spices, kalamata olives, feta cheese, tomatoes, and Hood Sour Cream. Grab a fork and dig in and don’t forget to eat the “bowl”! Thank you to Hood Sour Cream for sponsoring this post. As always, all opinions are 100% my own. Thank you so much for supporting We are not Martha! A rose by any other name would smell as sweet. But wouldn’t eggplant be so much more appealing if it wasn’t called… eggplant? What a travesty of a name considering it’s such a delicious vegetable (I know it’s technically a fruit, but come on; we all refer to it as a vegetable). I think all Americans should agree to come together and start calling eggplant by its British name, “aubergine” instead. Aubergine is such a pretty word when compared to eggplant. 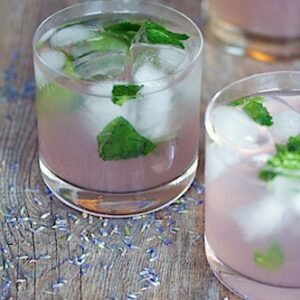 While we’re at it, let’s agree to call grapefruit pamplemousse (the French knew what they were doing!). Eggplant is not an egg that’s a plant and grapefruit has nothing to do with grapes, so clearly some changes need to be made. Agree? But seriously, I do think eggplant has a not-so-great reputation and its name is probably partly to blame. Also it looks funny. But that’s before you halve it; mix it with turkey, sour cream, and more; and turn it into a delicious meal, like this Mediterranean Turkey Stuffed Eggplant. And suddenly eggplant is beautiful and you find yourself craving it. Even as you’re actively petitioning to change is name. This is one of those dinners that looks all fancy and special, but is ridiculously easy to make on a weeknight after a long day of work. Don’t you just love dinners like that? 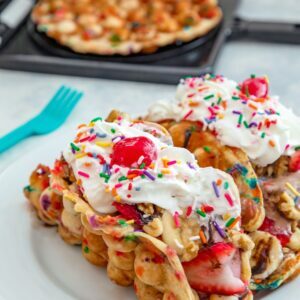 It’s also incredibly easy to make variations of and you are certainly free to switch up ingredients as you see fit. The important things? The eggplant, the meat (I used ground turkey, but feel free to use chicken, beef, or pork), and the Hood Sour Cream. I put a Mediterranean spin on this stuffed eggplant and used kalamata olives, feta cheese, tomatoes, and some Greek spices, too. 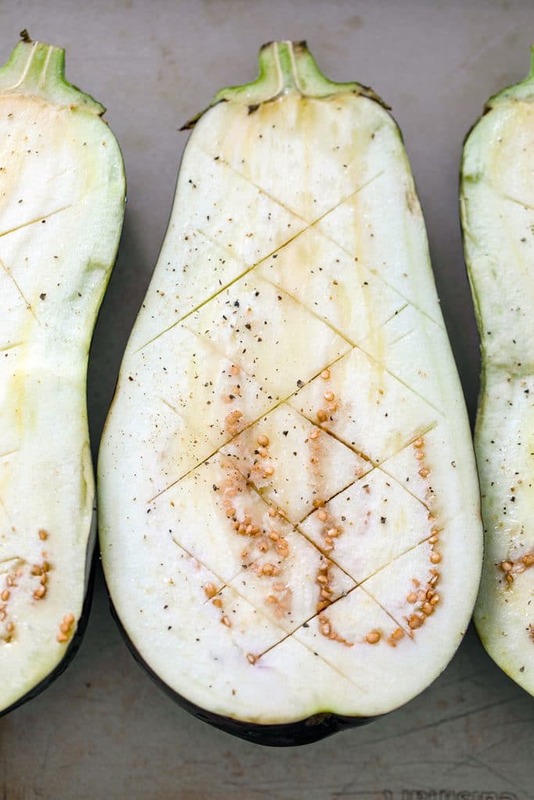 You’ll start by scoring your eggplant and baking them. Scoring means you’ll basically cut a zigzag pattern in each eggplant half so that they’ll bake evenly and scooping the flesh out will be easy after baking. Brush with a little olive oil and salt and pepper and pop in the oven while you get going on the rest of the dish. Cook onions and garlic in a skillet and then add the turkey, breaking it up until it’s cooked through. Then comes the fun stuff like the kalamata olives, feta cheese, and tomatoes. Like I mentioned, feel free to put your own spin on things! When the eggplants are out of the oven and cooled a little bit, scoop the flesh out of them, chop it up, and add it to the turkey mixture. Then comes the other fun part. Sour cream! 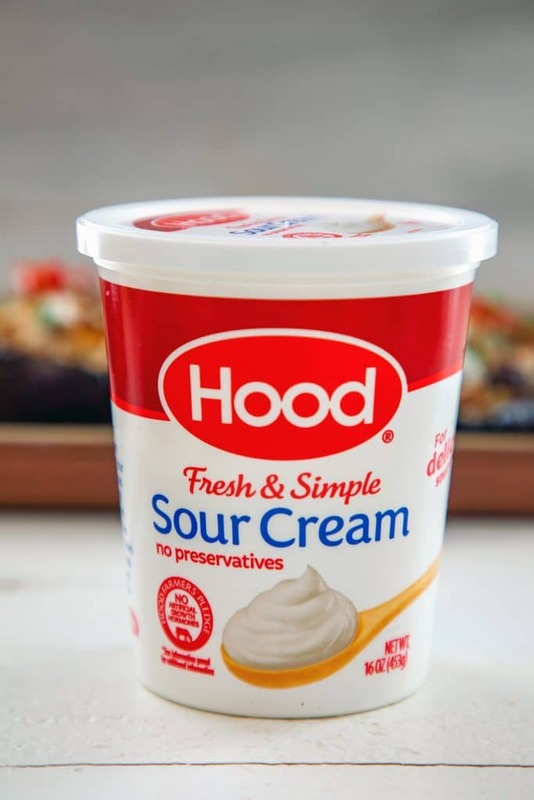 I use Hood Sour Cream because it’s made with high quality ingredients and always adds a rich, creamy and delicious taste to whatever I add it to. 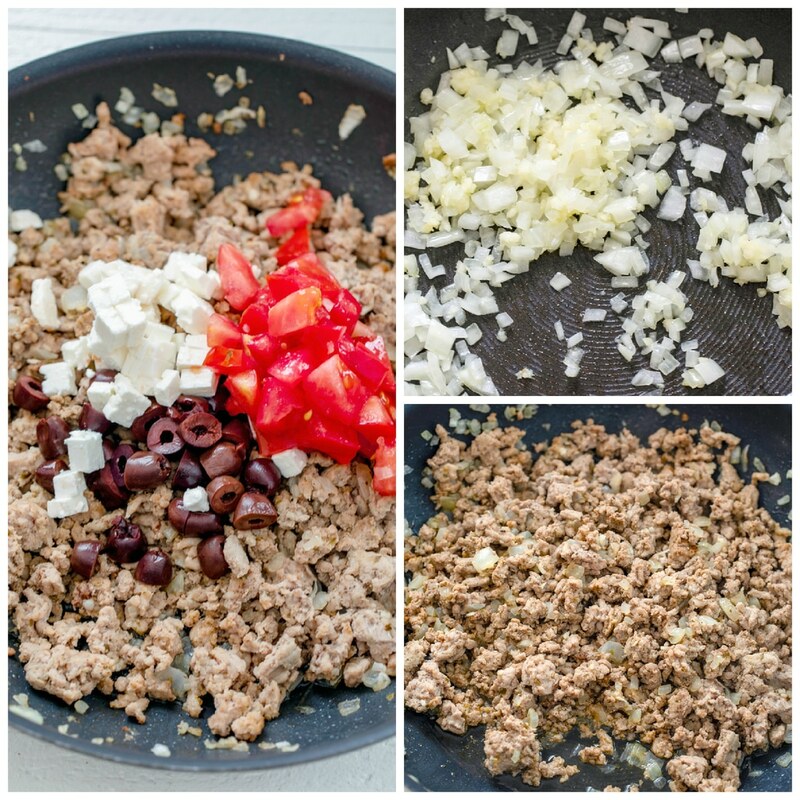 I’ve always used Hood Sour Cream as a simple topping for things like tacos or chili, but lately I’ve been incorporating it more into meals instead of just dolloping some on top. And it can seriously transform a meal from just OK to heavenly. It adds the perfect amount of creaminess to this turkey stuffed eggplant and a nice little tang that is always delicious, but especially in Mediterranean cooking. Time to scoop the mixture into the hollowed out eggplants and top with a little bit of panko for some crunch. After baking for about 15 minutes, put the eggplant under the broiler for just a few minutes. Garnish eggplant with parsley, chopped tomato, and some more sour cream and you’re ready to dig in! First of all, I love a meal where you get an entire edible bowl to yourself. And this is a serious all-on-one meal, which means you don’t need to serve any sides with it or anything like that… I mean, what else could you possibly want?? Some people will just eat the filling of the eggplant, but I love cutting into the “bowl” and eating the whole thing. The skin of the eggplant is where many of the antioxidants and most of the fiber is, so I highly recommend eating the whole thing. But, of course, the filling is the tastiest part. The spices, olives, and feta add a ton of flavor to the dish, while the sour cream makes the turkey super creamy and almost indulgent feeling. And because I’m big on the consistency of my food, I think that panko crunch is pretty essential to balance out the delicious creaminess. This is the kind of meal that’s easy to make on a workday, but it’s also super fun for a small dinner party. Also, if you can find mini eggplant (called fairytale eggplant), you could make a big batch of mini turkey stuffed eggplant and serve them as little appetizers. And do me a favor and make sure you tell your guests that they’re actually called Mediterranean turkey stuffed aubergines. I think we can make it stick. But if that doesn’t work, we can just keep serving deliciously creamy eggplant dishes like this one until we can convince the world of how delicious it is! 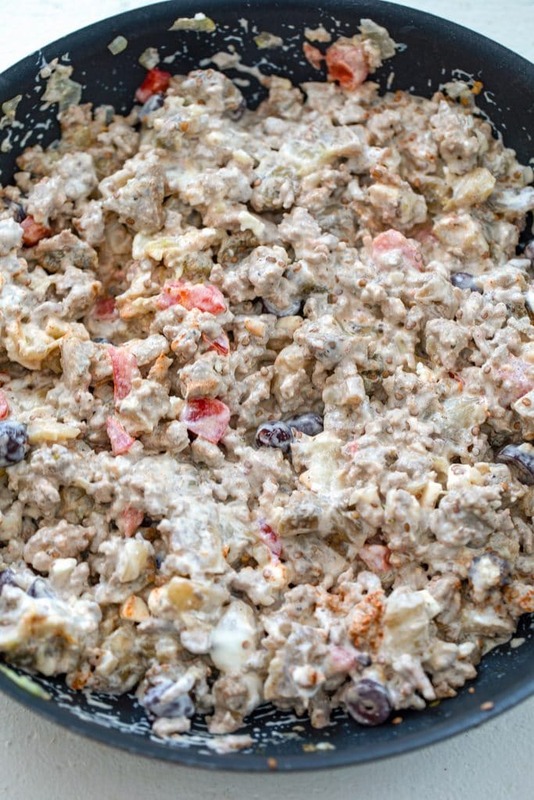 What dishes do you like to add sour cream to in order to up the creamy factor? 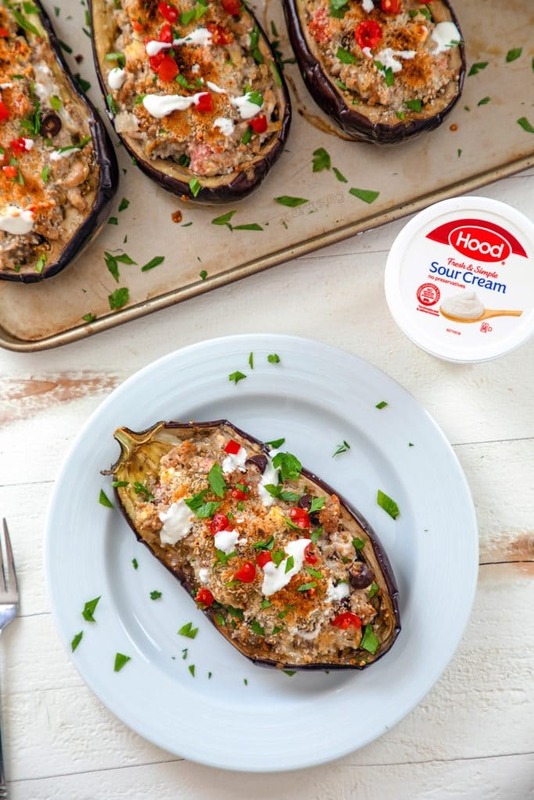 For more fabulous ways to incorporate sour cream into your meals, be sure to visit HoodSourCream.com. 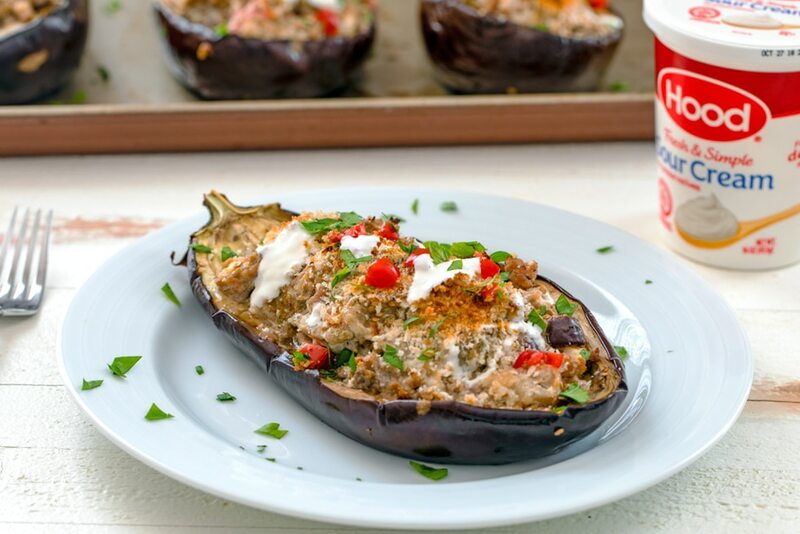 This Mediterranean Turkey Stuffed Eggplant is a deliciously creamy dish packed with ground turkey, Greek spices, kalamata olives, feta cheese, tomatoes, and Hood Sour Cream. Grab a fork and dig in and don't forget to eat the "bowl"! Slice eggplants in half lengthwise. Leaving about a 1/2 inch border around the edges and cutting deep but taking care not to pierce skin, score eggplant flesh diagonally one way and then diagonally the other way to form a diamond pattern. 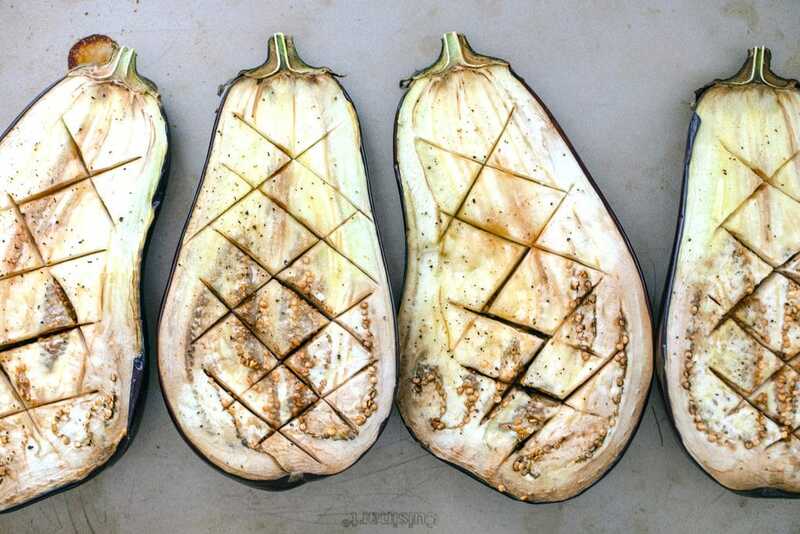 Brush each eggplant half with 1 tsp olive oil, 1/8 tsp salt, and 1/8 tsp pepper. Place eggplant halves on baking sheet and bake for about 30 minutes, until flesh is golden. Remove from oven to let cool a bit. When eggplants are cool enough to touch scoop out the flesh and chop it into cubes. Heat 1 Tbsp olive oil in a large skillet over medium heat. Add onion and cook for 4-5 minutes until translucent. Add garlic and cook for 2 more minutes. Add turkey to skillet, along with oregano, paprika, salt, pepper, and cinnamon. Cook turkey, breaking up with a spatula or fork, until cooked through. Drain excess oil from skillet if necessary. Stir in tomatoes, olives, feta, and chopped eggplant and cook for another minute. 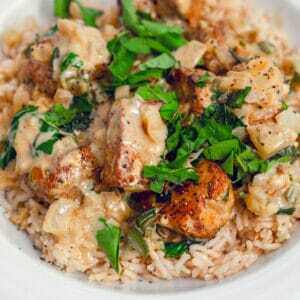 Remove skillet from heat and stir in Hood Sour Cream. Stuff eggplants with turkey mixture and sprinkle panko over the top of each eggplant. Bake at 350 for about 15 minutes. Then turn broiler on and broil for 2-3 minutes, until tops of eggplants are golden. Garnish eggplants with chopped parsley, additional chopped tomato, and additional sour cream if desired. 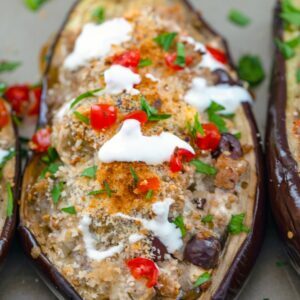 12 Responses to "Mediterranean Turkey Stuffed Eggplant"
This is one heck of a delicious stuffed eggplant. I love all the flavors in there! 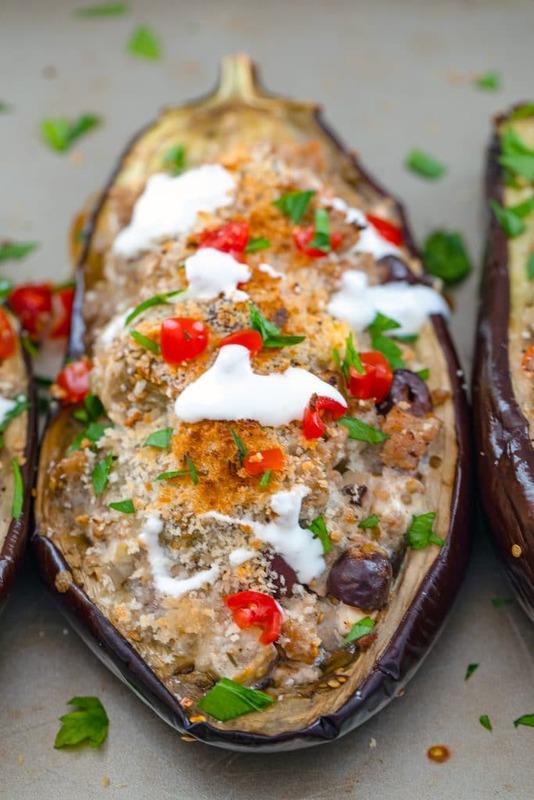 I love eggplant and this recipe seems so perfect for a weeknight dinner. Love the flavors and they compliment eggplant. I can’t wait to try this. 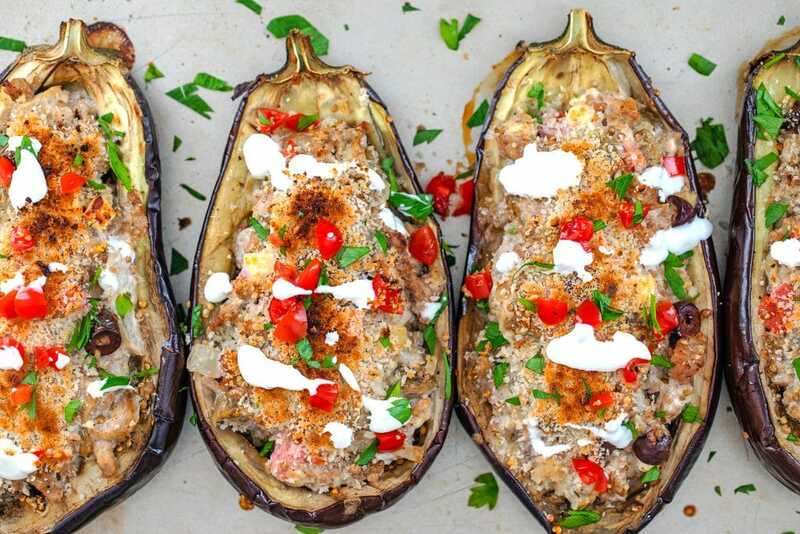 What a great idea, I love stuffed aubergine and those Mediterranean flavours sound delicious. I am loving all the mediterranean flavours going on in this and a great way to stuff vegetables. This is absolutely my kind of meal. I do not need anything else. Love eggplants! I’m always looking for new ideas for eggplant. Never thought of stuffing it. This sounds fabulous. Love Aubergines! Can’t wait to try this dish..Economic, nutritious & delicious! I love stuffed eggplant! (Maybe because it’s one of the few things I know to make with it?) Definitely looking forward to trying this version. Question: Can these be frozen after cooking? @Suzy- Hi! I’ve never tried freezing them, but I do think you could. I would freeze them fully on a baking sheet and then when they’re frozen, wrap them tightly in foil and put in a freezer-safe bag. 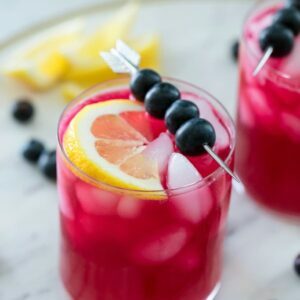 Just came across your recipe, thank you. Absolutely delicious. I hate when people say they “tweaked” the recipe but in my case I had to. I had to do a half sour cream and half Greek yogurt since that was all I had on hand. Plus, my wife thinks panko is over rated, so I used bread crumbs instead. I don’t think those two tiny changes hurt your wonderfully simple and delish recipe at all. Thanks again!